Gmail, probably the most used app on my Evo 4G, will be getting a major facelift with the introduction of Ice Cream Sandwich, bringing it into line with - and, in some ways, surpassing - its Honeycomb counterpart. 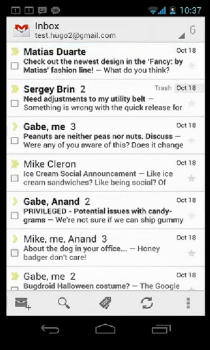 First of all, Gmail for Ice Cream Sandwich features an "action bar" at the bottom of the screen, much like Honeycomb's action bar, which allows users to create messages, search, sync, and more with just one touch. When messages are selected, the action bar changes to reflect your most commonly used actions, allowing for breezy batch operations. Adding even more shine to the new UI, the message view has been majorly streamlined, eliminating all the distracting drop shadows and rounded edges we saw in Gingerbread, in favor of simple headers (with lovely contact photos), and even 2-line previews in the inbox, to give you a peek at what's inside each email before you open it. In keeping with ICS' other interfaces, users can swipe between Gmail messages - something that adds even more to the simplified, intuitive nature of Android's latest iteration. Additionally, users can now search through messages when offline. By default, Gmail will save the last 30 days of your correspondences, allowing you to find important messages quickly and easily, no matter where you are. 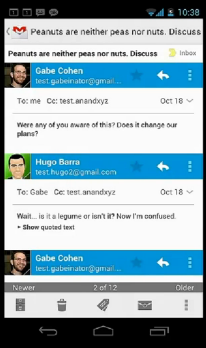 In many ways, I see the new Gmail app for ICS as an improvement even over Honeycomb's native app. It's smoother, faster, and looks amazing. Since I use the Gmail app at least a dozen times each day, it's nice to see that it's gotten some special attention this time around.